I went for a walk in our local park the other day. The trees were just turning their autumn golden-brown and russet colours. The sun was shining, reflecting in the lake; the sky was bright blue, and the air unseasonably warm, with a gentle fresh breeze. All was well. At times like that, it’s natural to feel praises welling up within you. Worship is easy. God is good! 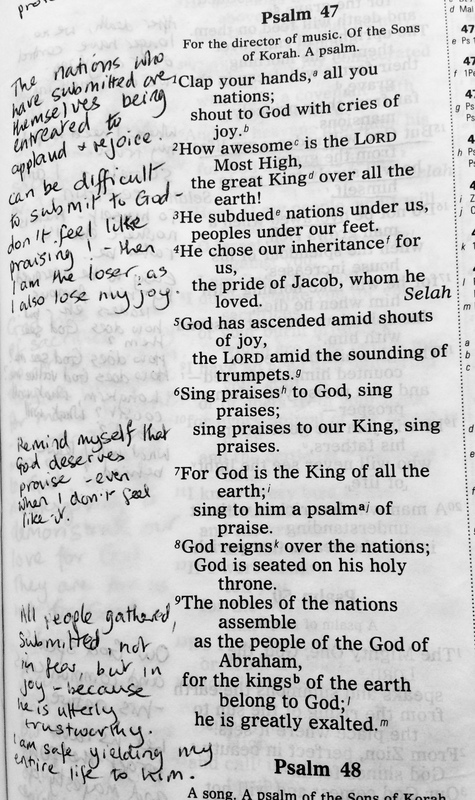 Psalm 47 has that sort of feeling. The psalmist was enjoying life, and praises rolled off his tongue. It was a great moment. Singing and praising are good for us. They release endorphins – the ‘feel-good’ chemicals into our brain, as well as increasing our oxygen levels. It’s not about how it sounds, but about how it feels. Never tell yourself you can’t sing – it’s an order! There are plenty of times in life when it’s hard to praise, when we have to discipline ourselves to rejoice, ‘because the bible tells us to’. Isn’t it great when you get those moments of sheer joy, when praise springs forth unbidden, and worship is the most natural thing in the world? Cherish those times, etch them on your memory, and use them as a resource to help you continue worshipping when the going gets tough. Joy is contagious. Read this psalm and catch some for yourself! This entry was posted in Bible, Christianity, Psalms, worship and tagged autumn colours, enjoying God, enjoyment of life, joy, praise, worship. Bookmark the permalink.